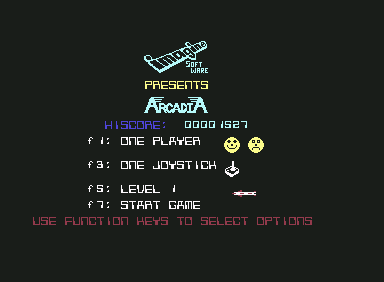 Information released on the ZX Spectrum as "Arcadia"
4.17 points at 12 votes (rank 813). 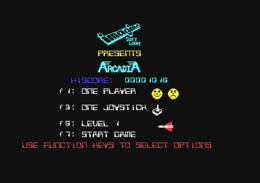 Rombach 7 September 1984 - "Vote 3"
"Arcadia" was the first game by the at that time young company Imagine (DH Lawson, Eugene Evans, Mark Butler) for the ZX Spectrum and during the release it was accompanied by an immense advertisement campaign, in which it was called "The Ultimate Arcade Game". 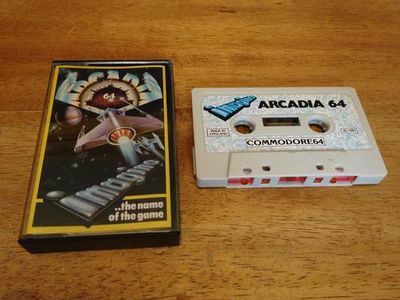 Some time later it was converted for the C64. The game itself is a relative of Invaders and the aim is to reach as many points as possible by shooting enemies that come in in waves. These opposing attack waves do not only differ in shape and colour, but also in flying direction and behaviour. To positively finish a level, one needs to survive until the counter - starting with 99 - has reached zero. The own spaceship cannot only be moved left and right, but also lift off from the lower border of the screen by pushing the joystick forwards. As certain types of enemies reappear a bit lower after leaving the screen, this is very important for survival. Very simple graphics (no scrolling), the enemies that show a different appearance and behaviour in every attack wave, flicker heavily. The sound is minimalistic. The controls are precise and fast, which slightly milds the high difficulty grade of the game. Unfortunately, there is no highscore list. Each attack wave has a different look, formation and flight path. Each of these waves has also a "weak point", i.e. there is a certain place where you are relatively safe at the beginning. To reach the next level you need to survive the time until the counter in the middle of the upper border of the screen has run to zero. There are 23 different types of attackers. The 22nd type appears in level 25, the 23rd in level 39. As the time until the counter has run to zero has to be prevailed, it is no use to shoot all enemies before that. This may get you points, but also a complete new enemy formation. Sometimes it is better to have one or two enemies left and only avoid them until the counter shows zero. 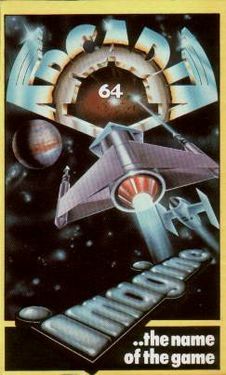 Rombachs C64-Spieleführer: "The game clearly shows its origin from the arcade halls. A simple idea was soundly processed. But if you do not carry out any competition with this programme, it will get boring fast (vote 3)." H.T.W: "The first thing that strikes are the extremely long loading times with the cassette version. This takes approx. 15 minutes. When the game has finally loaded and you play it for the first time, you can't believe your eyes. No, not because the graphics or the sound are so fantastic, but because the sprites that fly in an insane speed over the screen, flicker extremely. You will probably not notice more as the five lives are used up in next to no time. However, after you have occupied yourself with the game for some time, you will make the first levels and take in the formations and their way of moving. From this point on, the "I can make another level" effect appears. In short: an eye-killing space shooter with a bit of arcade hall character and a very high difficulty grade. 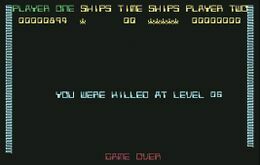 If there was also a saveable highscore list...."
Robotron2084:"An inconcievably bad Megamania/Threshold rip-off, that could at best make for a repulsive memorial for sloppily coded software. Each minute that you invest into this flubbed rubbish and the grotty collision query is uselessly wasted lifetime. Arcadia64 is so poor, you must have seen this (or rather not)! 1 out of 10 points, but only because you cannot give 0 points here." Equinoxe:"Is there a warning notice enclosed to the game saying 'Consult your doctor before using for a longer time!'? Danger of a true eyesore. 1 out of 10 points." This page was last modified on 26 February 2019, at 21:50.